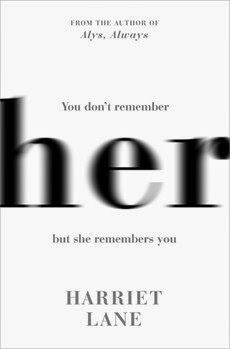 Her, Harriet Lane's second book is, like her debut Alys, Always, a literary psychological thriller. If you're wondering what that means, it means the thrills and the tension are ratcheted so tight as to be invisible and the horror cloaked in the everyday language of the mundane. It also means I happen to like it. Very much so. Emma is your everyday middle-class London mum - she has a young son, is pregnant with her second child, and she's struggling with the standard problems of that demographic. Nina is an artist with a late-teenaged daughter; she remembers Emma, and what Emma did. Alternating between the two characters, the reader is given Emma's story, that of domestic worries and mislaid items, of a new friend whose confidence and sophistication Emma wishes she could emulate; and Nina's story, that of long-held anger and opportunities engineered. Her is a tremendously quiet book and it's there its power lies. The way Nina sidles her way into Emma's life, and the almost-desperation with which she is greeted, is harrowing in its simplicity. The domestic scene provides a set-up rich with potential. The most terrifying things are those we believe can happen: it's why I've never been scared by Stephen King but still think of The Handmaid's Tale with dread. Lane exploits the everyday and in Nina writes a character whose terror lies in the ease with which she manipulates Emma, and the utter relentless normality. Which leads me to my complaint - I'm honestly not sure if I think the grand reveal is brilliant or hopeless. On the one hand it's chilling, deftly giving us the measure of Nina to set up the final scenes (oh! the details! those tiny, tiny details! ); on the other, it's mundane and pointless (but that is *why* it works). Pushed, I come down on the side of brilliant, but those expecting a psychological thriller with a dramatic endgame or similar will likely find this is not the book for them. In a world which appears to be swimming with domestic psych thrillers, Lane is an easy author to pass over for the more obvious terrors of The Silent Wife, or Into The Darkest Corner, but anybody who found those rather too packed with melodrama, Her should be your next book. 4 stars.